For 15 year old Mary-Kate, her Gluten allergy prevents her from being able to use pain relievers such as Ibuprofen when she experiences pain and cramps from Premenstrual Syndrome (PMS). Looking for a Gluten free product safe for her to use to relieve her cramps and other symptoms, Mary-Kate turned to SkinCatering’s all-natural SkinCare product, ‘Iron Maiden‘. According to the Mayo Clinic, more than 3 Million people in the United States alone are told they have a Gluten allergy each year. This is an allergy that is not curable and can last a life-time. You really don’t realize how many things you consume or use each and every day that contain Gluten until you can no longer consume it. There are also substances that may make symptoms of Gluten intolerance worse, such as anti-inflammatories and pain relievers. Gluten allergy or sensitivity is similar to Celiac disease with the main difference being that Gluten sensitivity does not permanently damage your intestines. However, Gluten sensitivity does enflame your intestines and cause irritation. When you take an anti-inflammatory or pain reliever it “increases intestinal permeability allowing for [food particles] to access the immune system…” If you already have intestinal irritation stemmed from a Gluten sensitivity, taking anti-inflammatories and pain relievers such as ibuprofen will only worsen your symptoms. Mary-Kate talked about her Gluten allergy and Dairy allergy in her testimonial video. Have you found yourself in the same situation as Mary-Kate and are still searching for alternative relief? You can find ‘Iron Maiden’ here. 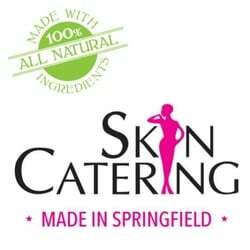 SkinCatering SkinCare ships internationally so don’t fret if you aren’t in the United States! Everyone can have access to our amazing SkinCare alternatives!